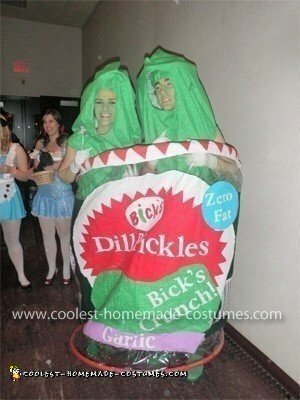 My fiancé and I were trying to find a unique idea for a Halloween costume and he said, “Why don’t we be pickles?” and that’s where it all began. We both love pickles and had never seen a pickle costume before. So we began figuring out how we could construct our costume. 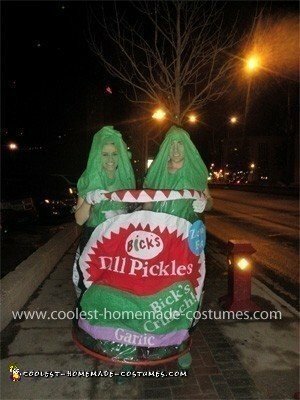 Our pickle couple costume took quite a while to make. For the pickles, we got green fabric and I just sewed two long sheaths with holes for arms and a face. I just measured our faces and arm holes, and made a rough pattern out of paper. I traced it on the fabric, cut it out and sewed it together. We painted our shoes green, our bodies green and donned white gloves for an extra effect. I think if I were to make it again I would have tried to find a better straight body suit pattern that could be used to look like a pickle, I may have made our face holes too big. The jar was more time consuming then the pickles. We decided to use a Bicks Dill pickle jar because that is our favourite type of pickles. We got a jar from the store and decided how we were going to mimic it. 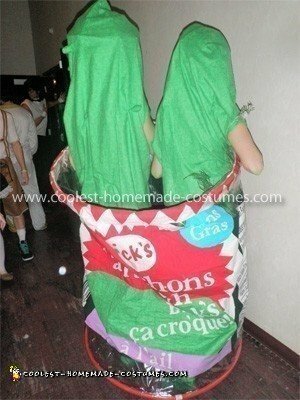 We bought two hula hoops for the base and top of the pickle couple costume. We then bought a clear shower curtain and taped it to the hula hoops, which made the form of the jar. After this, we cut and glued fabric onto the shower curtain for the label and lettering. We used a close font to the actual font of the Bicks pickle jar from Microsoft word. We made stencils for the letters on paper, then traced and cut the letters out of fabric. We attached string to the sides and then put the string around our shoulders to hold the jar up when we walked. On the costume we had the front in English, and we had the back of the ‘jar’ in French. On the sides we had a nutrition label and a bar code, which we found online and blew up to a large size. The best tip I can give to anyone trying to re-make this costume would to be to start on it early! The pickle couple costume ended up getting finished in time, thank goodness! After a lot of hard work, we took it to a university party in Saskatoon called the Monster Mash. We won Best Dressed Costume of the night!! We had so much fun. People really liked the costume, and most people ended up wanting to get in the jar with us for a photo opportunity. My fiancé also had a few too many beers and kept tipping the jar over with us both in it! 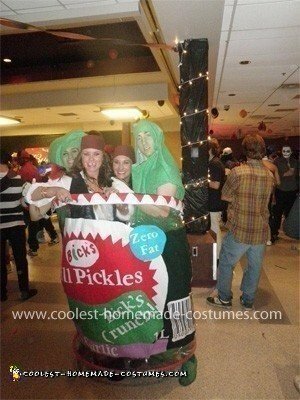 It ended up being a super great night, and totally worth the work of creating this pickle couple costume.